We’ve upgraded the Panel Widget to include Parallax Scrolling, a technique used in which background images move more slowly than images in the foreground, creating the illusion of depth and immersion, enabling you to create sections with this modern design trend. Parallax Scrolling has been included in all of our most recent templates or can be added to existing sites by adding a background image to a Panel Widget, then enabling the Parallax toggle. In addition to Parallax Scrolling, we’ve also added video backgrounds to our Panel Widget. To take advantage of video backgrounds, when using the Panel Widget, select “Video Background” under Video Type, then upload your file, or browse our library of stock videos available for Yola Silver customers. Using the Panel Widget, you now have the ability to create content sections with both fixed or responsive minimum height values. For example, a banner built using the Panel Widget can now be given a set height by pixel or percentage, giving you the opportunity to determine how much of the browser window the section displays in. If you want to create a section that takes up 100% of the browser window, no matter the screen size, you can set the Minimum Height to 100vh. Likewise, if you wanted to set a section to display just 600 pixels, you can do so by setting the panel to 600px. Minimum Height values can be adjusted within the Spacing tab of any Panel Widget. We’ve added horizontal and vertical alignment functionality within the Panel Widget, allowing you to define where your content should be placed. This functionality creates a grid, making it even easier for you to build the design you envision for your business. These alignment capabilities can be found with the Spacing tab of any Panel Widget. We’ve updated the Form Widget to have responsive input fields, allowing them to fill the entire width space in which they sit for a more modern and intuitive design. Due to the fact that the Form Widget now behaves responsively, if your Form Widget is not constrained within a content section (for example a Panel or Divider widget), it will fill the entire content width of the page. To achieve your desired width, place the Form Widget inside a Panel or Divider widget. If you have questions about these new features, we’re happy to help! Feel free to reach out to our Support Team at any time. We currently don’t have our own widget for a music player. When we decide which features to implement we take all the user feedback we receive into account, so thank you for taking the trouble to let us know that this feature is important to you. However, we are not in a position to tell you if or when this feature will be released as it is not currently on our list of short term priorities. If you would like to add a music player to your site, then you will need to add a bit of HTML coding. 1. Go to Widgets and select Popular from the drop-down menu. 2. Drag and drop an HTML widget. 3. The HTML Editor will open up, allowing you to paste the code. 4. Click Save and republish your site. “http://www.yoursite.com” is your site’s address. “resources” is the name of the File Manager (you must not change that). “folder” – if your file is in a folder, include the folder name. “file.mp3” is the name of your file. You also need to make sure that the path name is identical to the one in the File Manager in terms of upper and lower-case letters, dots, dashes etc. Although we are constantly improving and updating our software, any decision to use Yola should be based on the features currently available. On the form widget have you set it so a form can be placed at any position on the page and the response is able to be seen , rather than the page regenerating to the top of page and you have to scroll back down the page to read the response? I cannot believe y’all are still cannot offer a simple slideshow on their homepage. This seems like it should be a basic function. Also a music player is pretty basic as well with most websites, so I am not understanding why these changes which I have suggested several times have still not been addressed. Music players are rude. Professional websites will not force-play music. If you really need music, google how to add a music player using html. A little googling should get you there. Same with slideshow, it is really simple to add it in with html. I use wowslider, but I’m sure there are several options out there. Do you have a template that serves photographers and artists? I desperately need a slide show function on my home page. Try some freeware like wowslider. You can create a slideshow and they give you the html to enter into your webpage. That’s not a solution that is SEO optimized, this needs to be hosted ON yola servers for quick loading. When you add a Slideshow using our HTML widget, the code will be hosted on Yola’s servers. Please try adding it and let us know if you find that the slideshow is not loading fast enough. We do have an old template for photography but we’d rather recommend using one of our new Responsive mobile friendly templates which means that the content on your site will automatically adjust to fit different screen sizes when viewing the site on both mobile phones and desktop computers. To locate the responsive templates you can click the tab Style>Change Template>Responsive. With regards to choosing an appropriate template, you should never try choosing a template for exactly your industry or else you risk having a similar looking site than someone else. 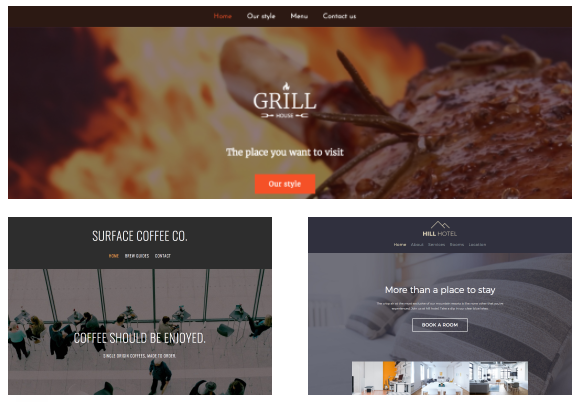 How we recommend that you choose your template is to find one that you like in terms of the layout and structure and then customize the template by changing the menu color and layout and adding your own images. I hope this information was helpful to you. If you have any more questions then could you please email us to support@yola.com for a quicker response time. The vertical alignment doesn’t seem that useful since you can only put a single object into the box anyway. Perhaps if you set a minimum height to the box and then just put in a single text box to centre text but this can be accomplished with margins already. The minimum height feature works best with background images. Since it’s only possible to add one background image, you are right in a sense that it’s only possible to “put a single object into the box”. That said, you can still add multiple other widgets into a Panel widget (like text boxes for example). Please reach out to us with more questions. Ive been a Yola customer for over 8 years and it just keeps getting better!!! Great work guys… Heres to another 8 years! Ditto this! I’ve been a very satisfied Yola customer for many years. Great to hear and thanks for sharing your happy feedback, it’s much appreciated! We are happy to hear that you are enjoying our new features. Thank you for the upgardes you are making, I like responsive templates but they don’t have sub-menu(like in premium templates), I upgraded to Gold member to have access to premium templates only to find out that those premium templates don’t have”LAYOUT” option, you can’t use “pannel widget” to have different banners on different pages, when are you going to solve this? In order to provide you with the best assistance, we kindly ask you to send us this message in an email to support@yola.com using the login email address of your Yola account. This allows us to access and review your account to accurately determine the issue and provide the best assistance possible. We appreciate your cooperation as we work to a solution together! Yes I contacted the “support team” already, it’s not about my account, it’s just that there is no option of changing the “banner padding’ or “footer padding” in premium templates because they don’t have ” LAYOUT” in “STYLE DESIGNER” like in responsive templates. They asked me to change to one of responsive templates but they also don’t have sub-menu(not navigation hover) which is only found in premium templates :). am I right? Is there any way of having a full loaded template that combines both responsive and premium options? Hi Gabby, we’re aware of this little shortcoming. However, as a workaround in the meanwhile, we may be able to provide you with some custom HTML to add banner and footer padding to your site. Can we ask that you please contact support@yola.com, from the email address linked to your Yola account and we will gladly look into possible solutions for you? We look forward to being of assistance. The old text has now rendered my sites ‘off limits’ to me. I prefer to use old text as it seems to be quicker to manipulate. But now, I get the tool bar repeated three times in a row. If I click, for example, on the fonts icon, I get all of the font options three times, at which point, the whole site crashes and I have to shut down in order to restore it, whereupon the whole annoyance is repeated. We are receiving reports that the Text Editing Toolbar is repeating across the site. Our engineers have been alerted and are working on a fix. In the meantime, you can still use the Text Editing Toolbar to format your text. Just make sure you’re using the very first section of the Text Editing Toolbar to make your edits. We apologize for the inconvenience and will let you know when this has been resolved. Hello, We have really appreciated your patience as our engineers have worked on fixing up the issues with the old Text widget. You should now be able to edit your site without any further issues. Please let us know if you’re still experiencing problems. Looks neat and cool. I hope this looks like the cinematic effect. Well done for a great effort. Thank you guys. Yola has been really helpful over the year. Keep up the good work. Thank you for your kind words. We are always happy to help. Yola is very helpful and more effective. If you need any assistance please do not hesitate to get back to us.